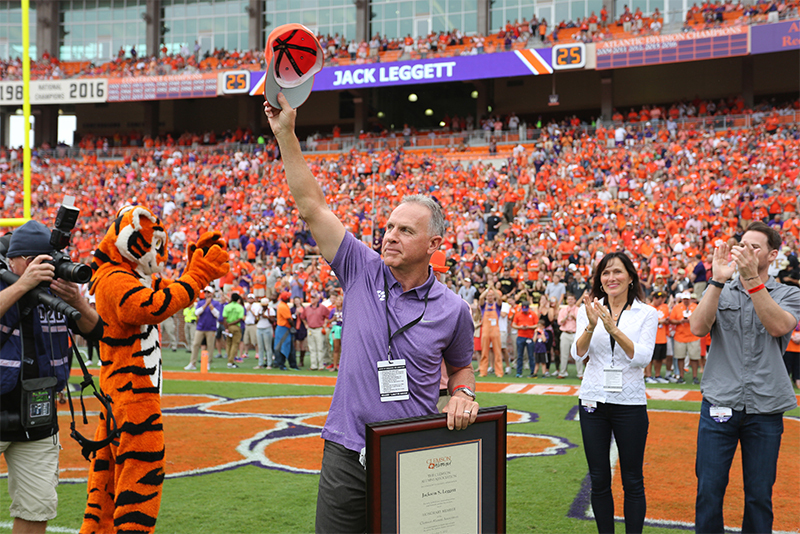 Former head baseball coach Jackson “Jack” S. Leggett has been named an honorary alumnus of Clemson. Leggett was presented with a framed resolution by alumni board president Sandy Edge and president-elect Mike Dowling prior to the Wake Forest football game. A University of Maine graduate, Leggett came to Clemson in 1992 as assistant head coach and recruiting director. He took over as head coach in 1994 and led the team to 955 wins and six appearances in the College World Series during his 22 years. With a total of 1,332 wins throughout his career as a coach, Leggett ranks as the tenth-winningest coach of all time among Division I baseball coaches. He was inducted into the American Baseball Coaches Association Hall of Fame in 2014.